THE NEXT STEP IN AFFIRMATIVE ACTION…. 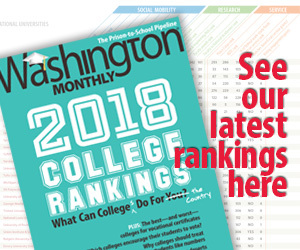 Richard D. Kahlenberg, a senior fellow at The Century Foundation, wrote a web exclusive for the Washington Monthly‘s College Guide section on affirmative action, income, and socioeconomic diversity. Critics of class-based affirmative action have long argued that programs that use economic admissions criteria do not produce as much racial diversity as programs that use race instead. Schools like U.C. Berkeley, for example, saw a decline in black and Hispanic enrollment after the ban on race-based affirmative action was put in place. But the data show that economic affirmative action can produce a positive racial dividend. According to a 2004 Century Foundation study by Anthony Carnevale and Stephen Rose, among the most selective 146 institutions in the country, using race-based affirmative action produced student bodies whose combined black and Latino representation was 12 percent. If students were admitted strictly based on grades and test scores, the combined proportion would decline to 4 percent, Carnevale and Rose found. But using economic affirmative action, defined by parents’ income, education, and occupation, and high school quality, produced a black and Latino representation of 10 percent. Research suggests using wealth (assets) as an admissions factor could boost the racial dividend further. Class-based affirmative action, in other words, does improve racial diversity, though not as much as using race per se. Carnevale and Rose also found that at these selective 146 institutions — the vast majority of which use race-based affirmative action — low income students were very scarce. Fully 74 percent of students came from the richest socioeconomic quartile and just 3 percent from the bottom quartile. Carnevale and Rose found that race-based affirmative action roughly tripled the representation of blacks and Hispanics, but that low income students received no leg up. Likewise, William Bowen — a strong supporter of race-based affirmative action — found that at 19 selective institutions, being black, Latino or Native American increased one’s chances of being admitted by 28 percentage points, but coming from a low-income family didn’t help at all. It’s an interesting piece. Take a look.